BOSTON, Massachusetts, USA—Thursday, March 9th, 2017—The Free Software Foundation (FSF) is now accepting donations to support the GNU Toolchain, a collection of foundational freely licensed software development tools. Many pieces of software depend upon the GNU Toolchain, including the GNU/Linux family of operating systems which runs the majority of Web servers, millions of personal devices and the most advanced supercomputers. A meeting of GNU Toolchain developers. Donations made through the FSF will help speed development of the GNU Toolchain projects, for example by compensating developers working on critical components, upgrading servers and other infrastructure, and facilitating in-person opportunities for collaboration and project advocacy. Donations are accepted in US dollars, Euro and British Pounds (email donate@fsf.org for transfer info), and Bitcoin. Since the FSF is a 501(c)(3) nonprofit, donations are tax deductible in the US, and many employers will match employee contributions. "This is another great initiative from the FSF aimed at providing funds benefiting the GNU Toolchain and its sub-components. While these projects enjoy a strong and vibrant community of both users and contributors, this fund will help at the operational level, providing additional support towards the collaborative improvement and growth of these projects and their community. It will also help those projects move forward in new areas that collaboration alone could not reach. I am looking forward to seeing this fund in action." GNU Toolchain projects maintain the standards-compliant compiler, header files, basic system libraries, and debuggers that provide a smooth and efficient experience for the GNU/Linux developer and user communities. Its subprojects include, among others: the GNU Compiler Collection (also known as GCC), the GNU C Library (also known as GLIBC), and the GNU Debugger (also known as GDB). Like all GNU software, the elements of the GNU Toolchain are freely available to copy, audit and improve. "The FSF has always been a forward looking organization, and they have shown it again today by creating this fund. It will enable the GNU Toolchain community to reach more users by focusing funding on key requirements faced by the entire GNU Toolchain community. Right out of the gate, we will be able to look at the continuous integration work being carried out by core projects like the GNU C Library and the GNU Debugger. This work needs support and maintenance to enable developers to accelerate the pace of innovation across all the supported configurations from servers down to embedded. It is really an exciting time for the GNU Toolchain." 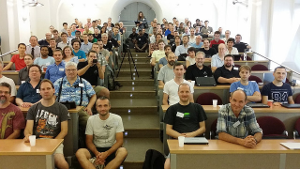 Support for the GNU Toolchain is part of the FSF's Working Together for Free Software initiative, which connects software freedom advocates to projects that need their help. Other projects that have benefited from this program include the GNU Guix package manager, the Replicant free mobile operating system, and the federated Web media-publishing platform GNU MediaGoblin. The Free Software Foundation, founded in 1985, is dedicated to promoting computer users' right to use, study, copy, modify, and redistribute computer programs. The FSF promotes the development and use of free (as in freedom) software—particularly the GNU operating system and its GNU/Linux variants—and free documentation for free software. The FSF also helps to spread awareness of the ethical and political issues of freedom in the use of software, and its Web sites, located at https://fsf.org and https://gnu.org, are an important source of information about GNU/Linux. Donations to support the FSF's work can be made at https://donate.fsf.org. Its headquarters are in Boston, MA, USA. Richard Stallman announced in September 1983 the plan to develop a free software Unix-like operating system called GNU. GNU is the only operating system developed specifically for the sake of users' freedom. See https://www.gnu.org/gnu/the-gnu-project.html. In 1992, the essential components of GNU were complete, except for one, the kernel. When in 1992 the kernel Linux was re-released under the GNU GPL, making it free software, the combination of GNU and Linux formed a complete free operating system, which made it possible for the first time to run a PC without non-free software. This combination is the GNU/Linux system. For more explanation, see https://www.gnu.org/gnu/gnu-linux-faq.html.